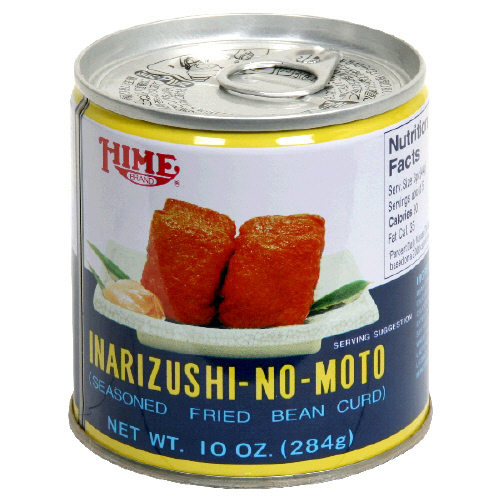 Hime Inarizushi Seasoned Fried Bean Curd, 10 oz. This product is in the form of a Semi Solid (in liquid) and is packaged in a Can. Ingredients: Bean-Curd (Soy Beans, Water, Calcium-Sulphate) Soy Bean Oil, Soy Sauce (Water, Soybeans, Wheat, Salt), Sugar, Monosodium Glutamate. Recipe for Inarizushi (15 to 17 pieces): 1 can (10 oz) of Hime-Inarizushi No-Moto, 2 1/2 cups of Rice, 1/4 cup Marukan Su (Japan Vinegar), 1/4 cup of Sugar, 1/4 Teaspoon of Salt, Ajinomoto MSG. Directions: Cook rice in usual manner. While rice is being cooked, prepare seasoning by adding sugar, salt and a dash of Ajinomoto to Marukan Su and stir until crystals are dissolved. Seasoned cooked rice with prepared vinegar. Stir rice well so that it will be evenly seasoned. Cool rice with a paper fan as you stir. Pack seasoned rice in Inarizushinomoto. Do not pack too solidly. Fold end of Abura Age to cover up rice. If you prefer vegetables in the rice, use Hime Gomokunomoto.